As parents, we need to instil the culture of reading within our children. There is no better way of doing this than reading about the life of Nabi Sallallahu Alaihi Wasallam, his Sahabah and our pious predecessors. Stories from their lives have been pivotal in reforming the lives of people throughout the history of Islam. We all know that children love listening to stories. So, read these stories to them and encourage them to apply the lessons they teach. Remember the Arabic proverb which states that knowledge acquired in childhood is like engraving upon a stone. 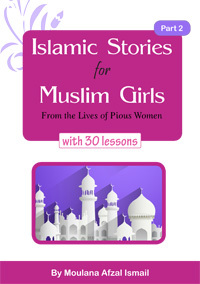 All the stories mentioned in this book are from authentic Islamic sources. The stories have been rewritten and phrased in order to appeal to the minds of young girls.